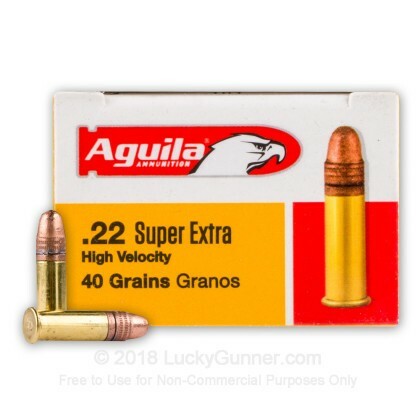 This Aguila's Super Extra 22 LR ammo features copper plated round nose projectiles and Eley Primers for consistent and accurate performance. 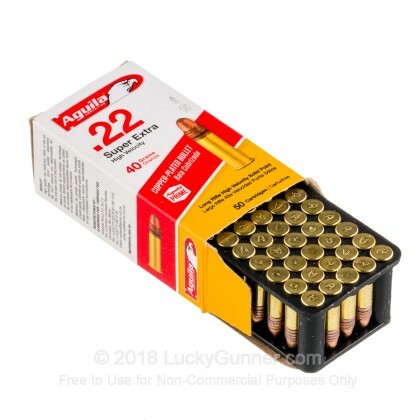 These 22 caliber rounds are ideal for target practice, plinking and hunting small game. Aguila ammo is manufactured by TECNOS Ammunition. TECNOS Ammunition has manufactured and marketed Aguila both domestically and internationally since 1961. Aguila is well known for its high quality and guaranteed accuracy. Known as a dependable ammunition, Aguila's established reputation is due to TECNOS' strict quality control system and highly advanced technological equipment. Aguila currently specializes in rimfire, shotshells, and centerfire ammunition.. The only brand I use. Highly recommend using this brand. 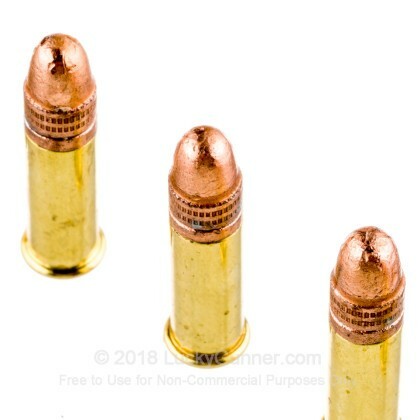 used in 10/22,marlin 60 and revolver and they love these pretty little cartridges.0 problems with this cheap round and ive shoot a whole lot of them. IMO this is essentially the Mexican version CCI Stingers and or Mini-Mags for less $$$. I cannot think of a better performance/value in this particular caliber. started shooting this stuff only because it was the only .22 ammo I could get my hands on but it's worked so well for my wife and I that we seek it out these days. It smells a little different but its good, reliable and accurate stuff and we shoot between 800 and 1200 rounds of it each month between us. I've been buying Aguila for about 10 years and have had no problems. My accuracy has improved. This is the only round I buy anymore. Eley priming smells "wierd" but these fire every time and are above average in accuracy. 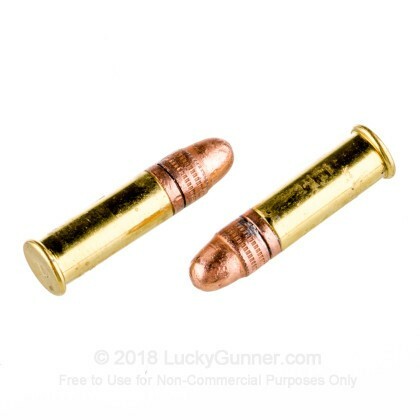 They might be a little dirtier than some premium ammo but at this price point and being available I'll buy all I can get! These rounds are reasonable and accurate. Unless they have suffered a QC problem due to overly rapid manufacturing to get in on the "Ammo-Craze" that's emptying American shelves..... Have had great luck with these in my (3) 10/22s and 2 bolt-actions. The bolts can hold 1.5 MOA or less, all day long at 100 yrds, the 10/22s are a mixed lot from a 16" carbine to a 26" special, their results vary with Bbl length. I also like them in my pistols, from PT22 , GSG 1911, to the old 4-22, they cycle just fine and accuracy is limited only by the shooters skill level. When I see these? I BUY THEM. 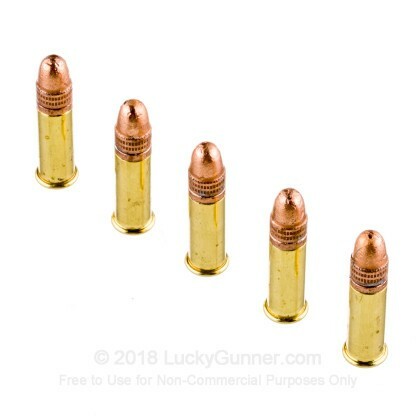 Yes, they smell a little "wierd" and are a bit dirtier than some other ammo, but when you shoot SK it's all slimy and that leads to other types of issues. So "Just chootem!" and enjoy being able to...... for now. 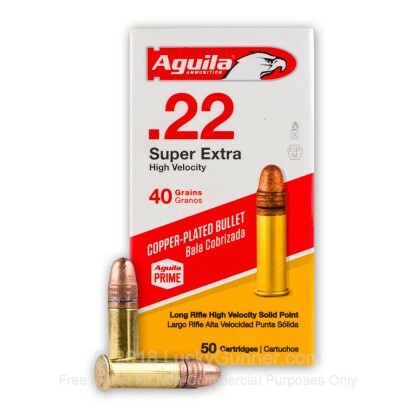 We also have this 22 LR - 40 Grain CPRN - Aguila - Super Extra - 500 Rounds ammo in stock in a bigger quantity.